I walked into the building and could feel the Latin beat pulsating, energizing the crowd. Pictures flashed as handsome Latino and celebrity models walked the red carpet. They walked in celebration of a heritage and to give back to the community. They walked for the Los Angeles tour of Latino Fashion Week. Not only did the event show case Latino talent, but it also gave back to the community. The V Foundation (www.jimmyv.org ), a charitable organization that is helping to find a cure for cancer, along with the Women Like Us Foundation (www.womenlikeusfoundation.org), an organization formed to empower women and girls, benefited from the proceeds of this event. The show began with the music of Andy Vargas, who is the lead singer of the infamous, Latin infused rock band Santana. Vargas is launching his solo career. He said, “I’m working with a lot of great people. I’ve been doing it over the years, but now I finally have the opportunity to gain some notoriety for what I am doing with my music.” After hearing his performance, his solo career is sure to soar. He rocked the house with the depth and power of his voice, astounding the crowd. LatinoFashionWeek from LatinoWeeklyReview on Vimeo. The collection of Walter Mendez has timeless silhouettes with a modern twist. “I’m always inspired by coral and water. I always wanted to incorporate textures and colors from the ocean in the beginning and then transition into more dark, edgy, flowy, feminine, and chic,” said Mendez. 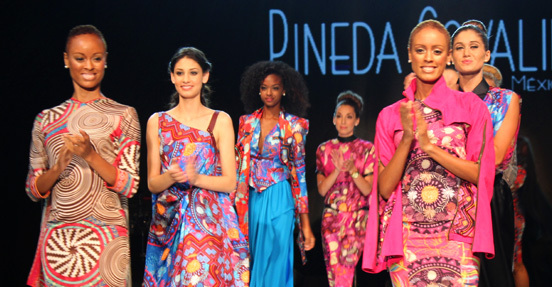 Mexican designer Pineda Covelin celebrates his Mexican heritage by using traditional symbols, figures, and images. He infuses these images with bold colors creating exciting prints that pique the imagination- a phantasmal world grounded in the images of the ancients. His designs are colorful and passionate like the spicy aromas of Mexican cuisine- full of flavor and depth with something exciting and unexpected in every mouthful. His designs were worn by “America’s Next Top Model” Don Benjamin and Marvin Cortez. It was an evening of diverse and fabulous fashion, but with the passion and rhythms of the Latino heritage making it a night to remember. May Latino Fashion Week continue to “wow” us with an entertaining show, but more importantly inspire the Latino community and the L.A. fashion community.